Some of the topics that the CEO Innovation Blueprint raises to help the CEO to bring the board on-board is around issues as having a very strong strategic vision. It’s very hard to bring people on specific issues. But if you explain that this is a strategic vision, then you can often sell the board on the strategic vision. 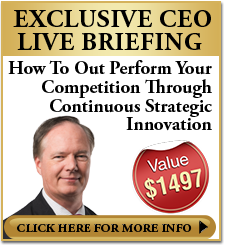 One of the critical things for a CEO to focus on as innovation leader is to drive a very strong strategic plan. Once you have a strong strategic vision with a strong strategic plan, it’s very easy to bring the board along as it’s very easy to drive the management to follow that vision. For the CEO to successfully sell a strong vision, it’s also very important to be credible. It’s very easy to exaggerate or to avoid looking at problems because you’re trying very hard to sell a concept. But the more credible, the more honest you are about the business problem and identifying the business problems and what can go wrong, that can be as important to selling that vision as identifying what could go right. One of the challenges with innovation is sometimes it takes longer to perform or that the cost go up. There are number of things where it doesn’t go to plan. It’s a big challenge because as soon as it starts derailing, you lose the support of the boards, you lose the support of the executive team. What tends to happen is that people try to withhold information or delay information because we believe that if we tell what’s happening, then we’re going to lose support. What we find at the moment is because people are risk-sensitive, they more react to what they don’t know than what they do know. If we keep the board up-to-date with what’s going on, even if there’s not much going on, that we show that we are keeping them aware of what’s going on, we’re keeping them aware of where things might be going wrong, they are more prepared to trust and accept where innovation isn’t quite going to plan. Again, this is where good, strong corporate reporting is helpful because it helps to keep the board informed. A well-informed board will be more prepared to keep supporting you with new innovations and taking new risks on new opportunities. 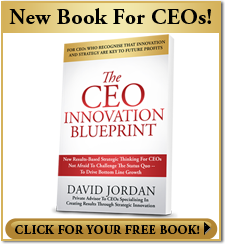 One topic that we keep repeating in the CEO Innovation Blueprint is it’s not about innovation, it’s about results. At the end of the day, you as a CEO have been tossed to drive growth and drive profit. 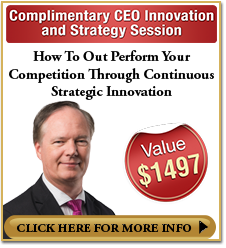 If innovation isn’t going to drive profit and growth, then should you be using that innovation? What we’re really focused on now – it’s not innovation that’s important, it’s the results that are important. A very good example was a recent seminar that we attended talking about Digital Instruction to financial institutions. We spent our morning listening to a number of speakers talk about exciting technologies, exciting new innovations. The problem is that not one stage through all the speakers that they mention about how to resolve a customer’s problem. If we’re not solving the customer’s problem, how are we helping to grow the business and grow revenue and grow profit. It’s one of the important things to bring perspective to innovation. It’s not about the technology. It’s about how it solves problems and how it grows the business.